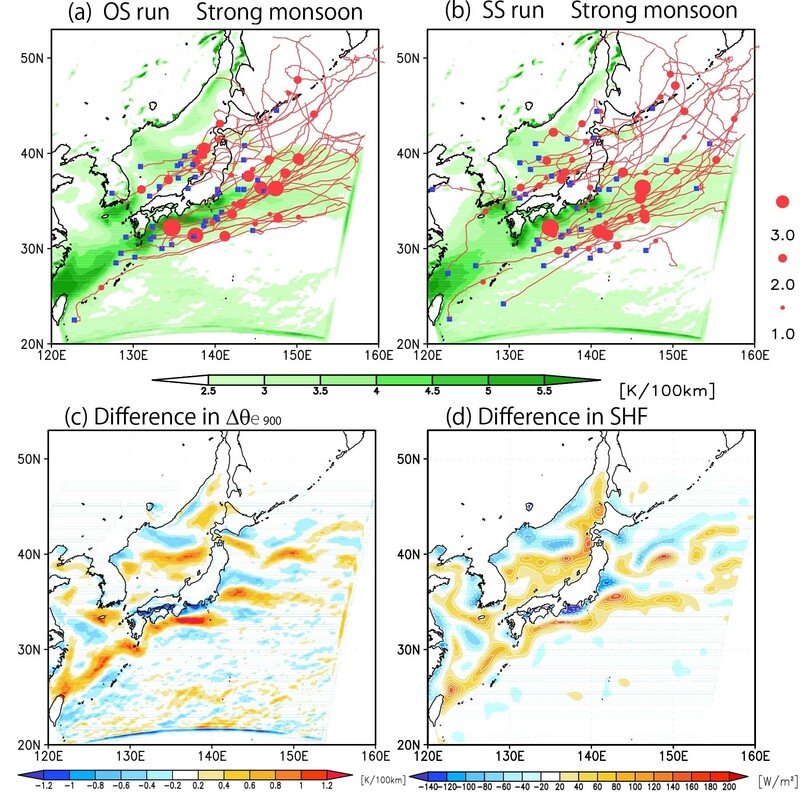 Iizuka, S., M. Shiota, R. Kawamura, and H. Hatsushika (2013): Influence of the monsoon variability and sea surface temperature front on the explosive cyclone activity in the vicinity of Japan during northern winter. SOLA, 9, 1-4. Fig. 5	(a) Composite map of the horizontal gradient of 900-hPa equivalent potential temperature under the strong monsoon conditions for the OS run, along with the explosive cyclone tracks. The shading interval is 0.5 K/100km. (b) As in Fig. 5a but for the SS run. (c) Composite difference in the horizontal gradient of 900-hPa equivalent potential temperature under the strong monsoon conditions between the OS and SS runs (former minus latter). The shading interval is 0.2 K/100km. (d) As in Fig. 5c but for the surface turbulent heat flux. The shading interval is 20 W m-2.